In this issue, we look at the ways that arts and culture work can be brought into, and more systemically applied, to place-based community development work. At the Facing Race conference in November 2016, Jobin-Leeds, along with his co-authors from the group AgitArte, presented a workshop on the role of art in social change. Coming mere days after the election, the reference to the famous Audre Lorde declaration that the “master’s tools will never dismantle the master’s house” felt apropos. The people in the room were ready to hear any message of hope. I was no exception. 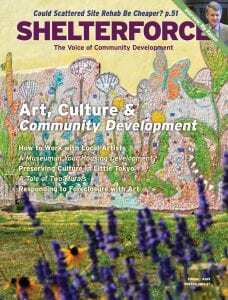 When we selected the articles for this issue, we were looking primarily at the ways that arts and culture work can be brought into and more systemically applied to place-based community development work. This intersection is by no means new—not only has it been around for thousands of years, but we’ve even been writing about it in the context of modern-day community development for well over a decade. In our January/February 2000 issue, for example, Donald Kelly, then community reinvestment manager at PNC Bank, called for regulators to credit banks under the Community Reinvestment Act (CRA) for supporting arts-driven community development. “A misimpression still lingers that art is only a matter of personal expression or entertainment and not about community building,” he wrote. “This misimpression reflects the 20th-century drift of art toward personal expression, but it fails to recognize the historic and now revived tradition of art as an affirmation of community.” Though it hasn’t necessarily come about through CRA, Kelly is probably happy to see the increased attention that arts in community building has gotten over the past eight years under the name “creative placemaking” (click here for more on how and why). There are projects that involve claiming and designing public spaces to be welcoming to all residents, or strengthening community identity and ties (here and here), or improving the process of community engagement and feedback, or making sure artists, who are important to a local culture, can afford to stay there. These things remain incredibly important and valuable—in fact many people have argued that the importance of local places and local government is only going to increase in the face of what will likely range from neglect to hostility from the federal level. But the election has also elevated the urgency of some other roles for the arts—in energizing resistance; in changing hearts and minds; in helping people overcome a fear of the other; in comforting the afflicted and afflicting the comfortable; and in maintaining a moral center in the face of big lies and swirling chaos. These too are not new roles, but we are going to need them a lot in the coming years. Creative protest and thought-provoking political art has been part of every crucial movement for justice. For instance, organizers who fought the foreclosure crisis in Boston employed art in their public demonstrations. Art was so central to the movements captured in When We Fight We Win! that the book was laid out with its artwork before the text was fully edited, Jobin-Leeds said, a startling departure from publishing norms. “It is through cultural forms that the establishment transmits cultural values,” noted Jobin-Leeds, saying this is why it is so important that we think about how to participate in these forms with our own narrative of how things work and why. What kind of cultural values do we care about? Fairness, compassion, honesty, equity, justice, progress? How do we embody these values in our work in visible and visceral ways? Luckily, I think these skill sets will cross apply. Building partnerships with arts organizations (see here and here) and learning how to work with artists in order to improve our community engagement processes or restore pride and hope in a neighborhood will also create working relationships that can be used in immediate protection of neighbors who are in danger or in political resistance to surges of hate and repression. Art, said Julio Salgado of Culture Strike in that same Facing Race workshop, “is one of the most beautiful ways to collaborate.” We hope that in challenging times you are able to tap into that beauty, and that strength, to keep fighting the good fight.